My chicken, apple and strawberry salad is refreshing and light and makes a wonderful springtime lunch. An extremely versatile fruit, the strawberry is great in salads, desserts, and with proteins. They’re also perfect in smoothies and as a snack. Since they are number one on the Environmental Working Group’s Dirty Dozen list (the highest in pesticide residue), be sure to buy them organic. Depending on where you live, they’re in season late April through August. 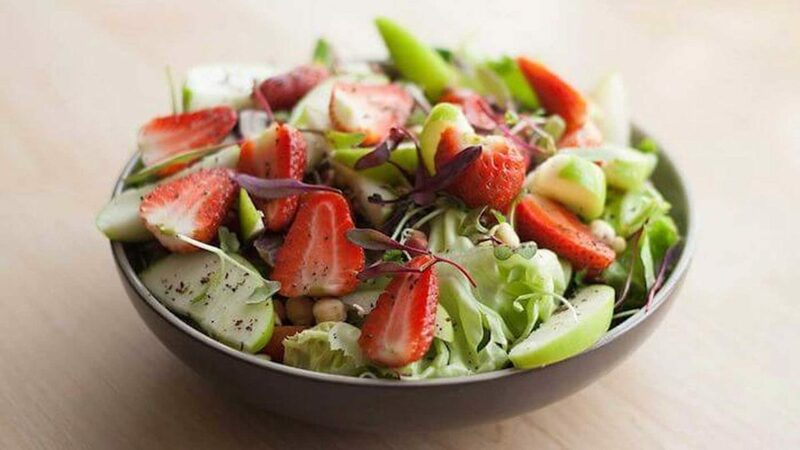 Divide the lettuce, chicken, strawberries, apple, and shallot between two large plates. Whisk the olive oil, lemon juice, dill, salt and pepper together in a small bowl. Top with amaranth microgreens and enjoy! Be sure to let me know how it turns out for you in the comments below!